My daughter has skin allergies and most soaps cause her to break out. We have been using Dr Bronner's soap for about a year now and her breakouts have reduced dramatically. However, this stuff is not cheap!! I have only found it at two local stores. One charges $9 while the other charges $11 for a 16 oz bottle. I recently found some Dr. Bronner's bar soap for $4 a bar that I was able to turn into a gallon of liquid soap. First you will need to grate the entire bar of soap with a cheese grater. In a large pan mix together half of your water, 2 T. glycerin, and your grated bar of soap. Heat up your mixture and stir constantly until all of the soap is dissolved. Once the soap is dissolved, remove from heat and let sit for 6 to 8 hours (or overnight if you wish). After letting the mixture sit you will notice it turn into a big glob of goo. Add some more water to your mixture. Continue to stir and add water until your reach the right consistency. If your soap is too thick you may need to heat it up a bit before adding more water. 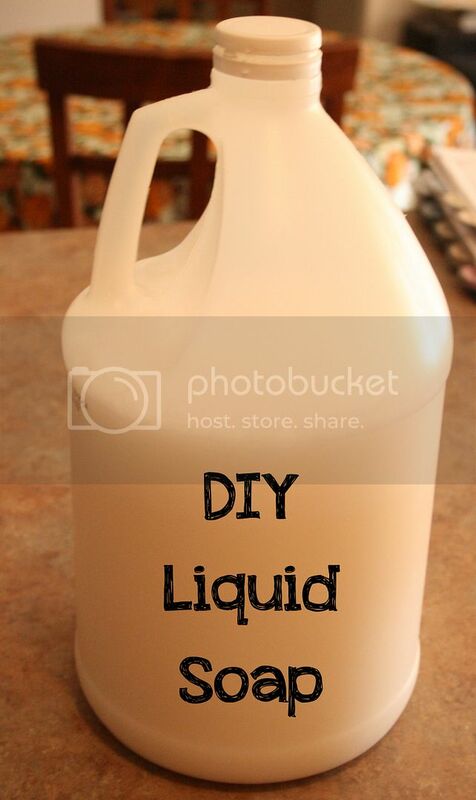 Most of the recipes I found for liquid soap have you adding the entire gallon of water to the pot right off the bat. After reading comments and realizing that there were so many varied results (some was too watery while other was too thick) I decided that this must be due to the brand of soap used. I ended up using the entire gallon for mine and it was the perfect consistency however I recommend that you start half a gallon and then add more to it later. i have made powdered soap before- loved it, but never this. might have to give it a try. thanks for sharing! FYI-a lot of people sensitive to soaps aren't allergic to the soap itself but either the perfume or more likely the glycerin. not saying this is the case with your daughter but it is often the case. Oops, I had a brain fart when I commented earlier. I was thinking about lye not glycerin. My Dr doctor told me that it could be the lye in the soap that was causing her to break out. I know that once we switched to Dr Bronner's she still got rashes but they had greatly reduced. However, I have been using the above recipe for about a month now and have not noticed a single rash. Although this could be due to the fact that we have had a great increase in humidity here due to the rain we have been getting. (I live in AZ and it is normally really dry which also has an effect on her rash) So I can't say for sure that it is the soap or the humidity that is helping but I'm going to stick with the soap for now. fyi - it's impossible to make soap without lye. All soap, including Dr. Bronner's starts with a lye & water (or other liquid like goats milk) mixed with oil. The lye reacts with the oils and turns them into a salt (soap! )In the process, the lye is completely consumed. After it has cured, no lye remains in the soap at all. Most people have a reaction to the "detergents" that most commercial "soaps" are made out of. People with highly sensitive skin are usually encouraged to use natural old fashioned lye soap because it can be very gentle (like olive oil soap known as Castile). Geez, I hope that didn't sound snooty. lol It was meant to be informatiive not snooty! Have a great day. well said to the uninformed and uneducated ..helps people understand fully about the process..thank you !!!! I make and sell home made soaps and also Kirk's Castile soap too ..I show clients how to make 10 gallons of liquid laundry soap for 6.00 ,with a bar of any cold process soap(grated ) , 1 cp washing soda and 1 cp borax ..you can also make (with a little modifications ) hand soap , dish soap and shampoo ,I even make soft scrub for ceramic cook tops and bathroom sinks ..and fragrance them with essential oils like lavender ,peppermint or ylang ylang ..
...can you make it without the glycerine...?? I have not tried making it without glycerin. I am sure there is a way but this one is working great for me. i love love love this idea! i'm going to try it. i am curious though if you've responded to the comment about making it without glycerine? also, does this recipe ruin the pot it's heated in or should i consider buying an old cheap pot? I am not sure about making it without glycerine. I have not tried it. I use stainless steel pots for making soap and cooking and have not ruined any. I can't say the same for other pots but the stainless steel ones work well. What a lovely site! As a thank you gift I present a tip I learned from Ellen Sanbeck of "Green Housekeeping".....Dr Bronner's is meant to be diluted. Cut it by 50% for cleaning or by as much as 1/3 for bodywash....Hope this helps it go further for you. When do you add the oil and are you talking about fragrance oils? Plain corn syrup (believe it or not) makes a good alternative to glycerine. Thats what I have used and it worked just as well. Google glycerine alternatives. It is cheaper too....by alot! Does this recipe make a sudsy soap? The Secret to 'Faking' a Clean Kitchen.